36% reduction in water use compared to the EPAct 1992 baseline. The Peabody Terrace dormitory complex, designed in 1963 by Sert, Jackson & Gourley, is a composition of low‐rise and high‐rise towers that form a series of shared open spaces across from the Charles River. 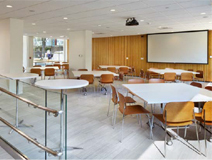 In addition to a separate, ongoing envelope repair, abatement, and waterproofing program to preserve the exterior façade, the Peabody Terrace Graduate Commons project in “Building E” included renovating the common areas and new residential Director's Suite within the existing floor plan. Building Owner, Harvard University Housing, tasked the project team with designing the spaces to update HVAC systems, maximize daylighting, reduce utility dependency, and incorporate sustainable materials, while maintaining the integrity of the original exterior design and the character of the interior aesthetic. Throughout each phase, the project team embraced the challenges of renovating a significant architectural landmark. For example, because of the low ceiling heights and the lack of typical floor and ceiling cavities, the integration of new HVAC systems and ductwork while adhering to current building code proved difficult. Furthermore, the design team took particular care in preserving and re‐using acoustical wood paneling that is prevalent in the lobby and Common Room area, recognizing this system as a significant design feature to the building’s history.The Peabody Terrace dormitory complex, designed in 1963 by Sert, Jackson & Gourley, is a composition of low‐rise and high‐rise towers that form a series of shared open spaces across from the Charles River. In addition to a separate, ongoing envelope repair, abatement, and waterproofing program to preserve the exterior façade, the Peabody Terrace Graduate Commons project in “Building E” included renovating the common areas and new residential Director's Suite within the existing floor plan. Building Owner, Harvard University Housing, tasked the project team with designing the spaces to update HVAC systems, maximize daylighting, reduce utility dependency, and incorporate sustainable materials, while maintaining the integrity of the original exterior design and the character of the interior aesthetic. Throughout each phase, the project team embraced the challenges of renovating a significant architectural landmark. For example, because of the low ceiling heights and the lack of typical floor and ceiling cavities, the integration of new HVAC systems and ductwork while adhering to current building code proved difficult. Furthermore, the design team took particular care in preserving and re‐using acoustical wood paneling that is prevalent in the lobby and Common Room area, recognizing this system as a significant design feature to the building’s history.